One of the greatest animated films of all time, here to make you sob bitterly all over again. Some people say it's a sad movie. Some people say "Damn, that's a sad movie." Even more people say "Oh my god, I have to write a letter of apology to the Japanese people RIGHT NOW!" Those people are all heartless bastards. None of those statements can really capture the true emotion of this movie. The sentiment that it conveys is simply too strong for words. I have seen big men, bragging about how they never ever cry at movies, finish this one with tear-stained cheeks and a runny nose. It's amazing to me how an animated film (or "cartoon," as the uncouth say) can have such a sobering effect on even the most strong-willed among us. 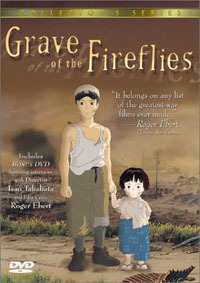 That said, I think it's important to mention that Grave of the Fireflies is so much more than just a tearjerker. It's a movie about survival, family, war, and how they affect one another. It's basically a period film, set in Japan in the latter portion of WWII. The movie is about the family of the young teenage Seita and his four-year-old sister, Setsuko. Their mother is caught in a bombing during an American air raid and their father is in the Japanese Navy, thereby leaving Seita and Setsuko effectively orphaned in war-torn Japan. Moving from shelter to shelter and then to the home of an uncaring relative, the children slowly slip between the cracks of the system, sustaining themselves at first by trading their worldly goods for food and then subsiding on government rations alone. Despite suffering through endless raids, infuriating encounters with his aunt, and numerous unanswered letters to his father, Seita still strives to make a life worth living for himself and his sister. At this point, I would like to make something very clear: The love between siblings is unlike any other. Even when they fight, they will almost always stay together in times of hardship. That kind of love is unique and Seita and Setsuko exemplify it beautifully. When food was scarce and starvation loomed darkly on the horizon, Seita shared the last which he had fought for with Setsuko; that was love. When the world seemed to fight against them, yet Seita still made time to catch fireflies for Setsuko and took her to the beach; that was love. When Seita wept because their harsh, uncaring aunt had told Setsuko the painful things he protected her from; that was all for love. In the end, it was that love that was the most important thing of all. Isn't it amazing how love works? As for the disc itself, I was pleasantly surprised with most aspects of this well-put-together 2 DVD collection. It is presented in a clear case with a nicely stylized outer and inner cover. The coolest part about it is that the first DVD is on what I can only describe as a binder-style page that flips back and forth, and the second DVD is in the typical place, inside the back cover. The first DVD houses the sub/dub feature film. The second disc, or Bonus Disc, has a copious amount of information. It has interviews with Roger Ebert and members of the production team. It also has a segment with a discussion between a Japanese and an American historian about how the film compares with its historical context. Also included are the original Japanese trailer, bonus storyboards, an art gallery, and other little bonuses that really fill out this release. The two main downsides that I found in this release are both things that could be construed as "personal problems." First and foremost, when I had several friends over to watch the movie for the first time, the movie jumped to incorrect scenes 2 or 3 times during the movie. However, I must stress that this may be due to an imperfection in my own DVD-ROM rather than a problem with the disc itself. The other problem I had with the disc is one that I have with many other US releases: the English dub acting is rather wooden in many places. Don't get me wrong, sometimes it was laced with emotion, but it was nowhere near comparable to the original Japanese release. Although wooden voice acting is just a gripe in many other releases, it particularly upset me in the case of this movie. This is mostly because it truly detracted from the emotional impact of the film. The music is perfect, the Japanese dub and English subtitling is very decent if not superior to many others, but the English dub is simply not quite up to par. Overall, I was essentially very pleased with this release. No fan of animated feature films or war movies should be without a copy if this film on their top shelf. The two detractions that I mentioned are very minor in comparison to all the wonderful things that this release from Central Park Media has to offer. I highly recommend this film to movie lovers and true anime fanatics alike, but remember to have tissue nearby. You have been warned.